Do you own a motel? A restaurant? A small office? Want to save some money and energy for your business? 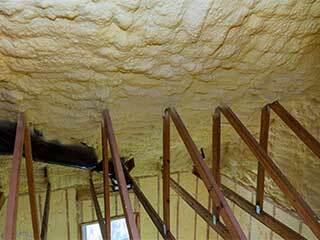 It’s time for you to check your insulation. Unlike residential homes, many commercial buildings have attics that are not properly insulated, or at all for that matter, which means more money spent on air conditioning systems that work extra time to heat or cool the premises. Here are two examples for every business owner’s fears and the perfect solution for them. It’s the middle of a hot summer night. Your motel guests suddenly wake up sweating in their bed. They dress and come to the reception to complain about the service. It turns out that the problem is not with the air conditioning but with the attic, which was not adequately insulated. That caused the temperature in the room to stay high as the temperature outside and prevented the room from properly cooling. It’s the middle of a rainy winter day. Your restaurant's patrons are enjoying some good time and good food while the ceiling suddenly starts leaking. Big drops of water come dripping down on the floor, on plates, into glasses, on guests' heads… making them leave your restaurant annoyed and with no intention of ever coming back again. It turns out that the attic was not properly insulated and let water in. Now, not only have you lost business, but you also have to deal with water damages. Whether it’s a motel, a restaurant, a church, an office, a grocery store, or any other building for that matter, every facility or commercial building must have perfect insulation that will keep their guests, clients, tenants, and staff members happy and comfortable. It’s time for you to make the right decision for your business. It’s time for you to call Attic Cleaning San Jose. Our services include: air sealing, insulation installation, crawl space cleaning, and many more. Our team of experts will simply make your life better and easier. Save money & energy – improve your business.